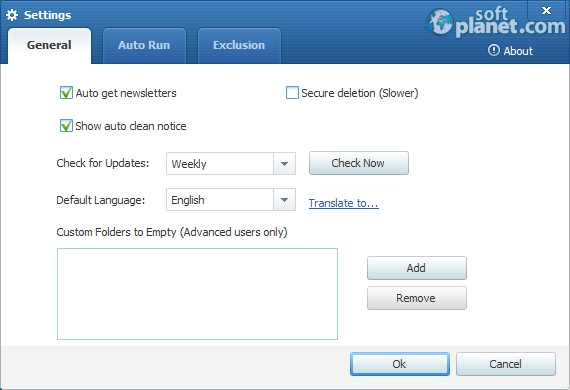 SoftPlanet makes it possible for everyone to get free Wise Disk Cleaner download directly from our servers. There is no registration needed for downloading. Wise Disk Cleaner 8.91 is a free-to-download and use program which deletes all temporary files, cookies, privacy traces and all unnecessary Windows files. These files reside on your computer in many different locations. They are there because every time you surf the web you collect them no matter if you want it or not. Or when you install an application, and then remove it from your computer, not all the files related to this program are deleted. Wise Disk Cleaner has many features, but the latest are updated translations, Adobe Reader and Photoshop cleaning support, a new advanced cleaning algorithm, Slimming System and Disk Defrag. Also some minor bugs have been fixed. Its interface can be used with 40 different languages. Unfortunately there is not too much information about how to operate the program so you have to learn it on the go. 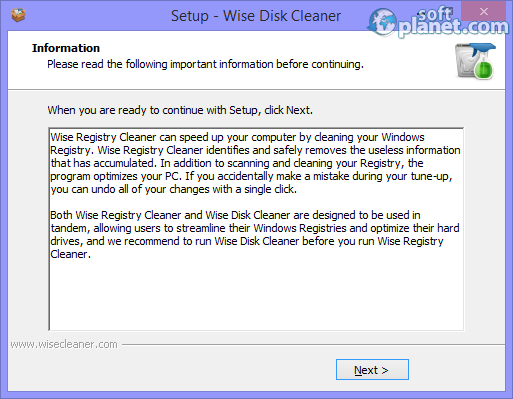 Wise Disk Cleaner will attract you with its well-developed and structured interface. All the main tasks are grouped in four tabs, which are located on top of the window. Brief information about the space saved is displayed on the right. The Scheduler feature is also located there. Some of the few settings, which the program has, can be changed very easily by opting in or opting out the check boxes located in the three settings tabs. Any user has to click over the green button in the upper right corner to start the Common or the Advanced cleaner. Wise Disk Cleaner 8.91 has Advanced settings where the file types, which will be deleted, can be chosen. There are also check-mark options for invalid shortcuts and empty files, but this will slow down the cleaning speed. Wise Disk Cleaner does what it promises. Also it can backup everything before you start, so any possible problems are eliminated. This program is very clever and that is its advantage from the rest of apps in the same category. We tested it and were nicely surprised from the good results this program achieved. We recommend it to you because of all its features and last but not least because it is free-for-download and exercise. 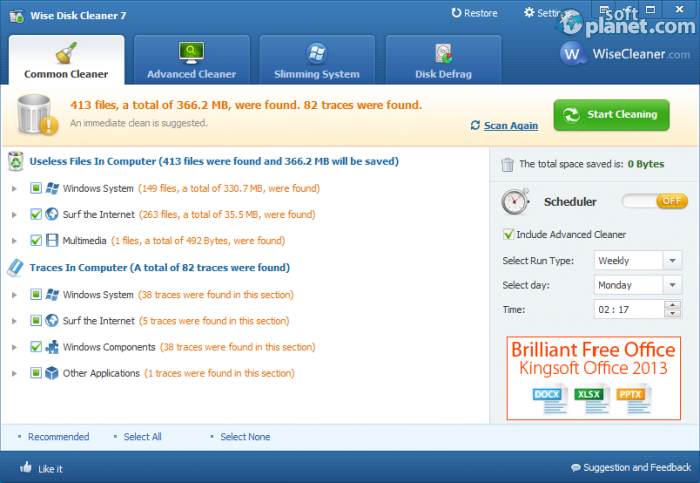 Wise Disk Cleaner is VIRUS-FREE! Our security scan shows that Wise Disk Cleaner is clean from viruses. The current version of Wise Disk Cleaner has been scanned by our system, which contains 46 different anti-virus algorithms. That ensures that Wise Disk Cleaner 8.91 is 100% safe for your computer.